Introduction: In this lab, you will observe the diffusion of a substance across a semipermeable membrane. 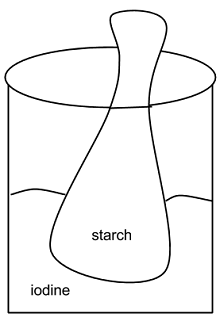 Iodine is a known indicator for starch. An indicator is a substance that changes color in the presence of the substance it indicates. Watch as your teacher demonstrates how iodine changes in the presence of starch. Prelab Observations: Describe what happened when iodine came into contact with starch. Fill a beaker halfway with water and add ten drops of iodine. Place the baggie in the cup so that the cornstarch mixture is submerged in the iodine water mixture. While you are waiting, answer the questions. 4. Molecules tend to move from areas of _______ concentration to areas of ______ concentration. We're going to think about concentrations now, which substances are more or less concentrated depends on which one has the most stuff in it. 1. Based on your observations, which substance moved, the iodine or the starch? 2. How did you determine this? 3. The plastic baggie was permeable to which substance? 4. Explain how the bag is a model for the cell. 5. Sketch the cup and baggie in the space below. Use arrows to illustrate how diffusion occurred in this lab. 6. What would happen if you did an experiment in which the iodine solution was placed in the baggie, and the starch solution was in the beaker? Be detailed in your description.